When I was pregnant, a friend introduced me to a special community yoga center in Washington, D.C. called Lil Omm. The founder, a woman named Pleasance, created an embracing space that’s so open and welcoming that you easily feel invigorated with every visit. Each week, until I delivered, I took several prenatal classes at Lil Omm. It was a great source of comfort and strength for me to meet other moms and soon-to-be first time mothers like myself at the time. But what’s really quite wonderful about this community is that they try to find solutions that help make yoga possible for everyone, particularly parents of little ones. They offer parent/child classes, childcare during adult classes, and playtime classes that invite parents to practice while their children play. After my son was born, it was fun for my husband and I to attend baby yoga classes on the weekends with other new parents experiencing many of the same things we were. Every now and then, Lil Omm has a special yoga practice class called Moms Night Out—an evening dedicated to motherly love, reflection, joy, community and connection. It’s a great opportunity to see old and new faces and catch up with each other’s lives, but most importantly, it’s a time made free of all other worries and cares. In that time, there are no other responsibilities but to ourselves—to practice yoga that helps connect, stabilize and ground us. After an hour of practice, there’s usually wine, chocolate and much love for all. Yes, it’s a very special place. The last time I attended Moms Night Out, Pleasance shared this poem. It’s a love letter to mothers everywhere. Please feel free to share it with the mothers in your life. Dear wonderful, sweet tired, worn-­out You. Clear your mind of all thoughts. Forget the morning’s drama. Forget the battle cries. Forget the way things just didn’t go well this morning. Rest. Let go of the day’s worries and stresses. Just be. Know this. Know just this. In the middle of all of what you see as mistakes and failures and imperfections there is so much perfection and beauty. You are their Sunshine. Their umbrella. Their warm blanket. Their hand to hold. You are their patient. Their student. Their baby to babysit. Their fellow swashbuckling pirate. You are not told it enough but you are loved. You are loved for how, at the end of the day, you make everything better with a single kiss and a bedtime story. You are loved for your gentle touch and playful laugh even when all you feel like doing is taking a nap. Sleep little baby don’t say a word. You are loved for how you bring everyone together by offering a nourishing meal, a good night’s rest, clothes that match, games to play, piles upon piles of books to read. You are loved for making sure everything is just the way it needs to be. Always. Day after day. Season after season. Year after year. Phase after phase. In the middle of what you see as mistakes and failures and imperfections there is so much perfection and beauty. Your warmth. Your security. Your faith. Your trust. Your love. Your give-­everything-­you’ve-­got heart. Your it-­will-­be-­ok messages. Your eat-­your-­veggies please. There may not be a village holding you up. There may not be a village patting you on the back. There may not be a village giving you a break. There may not even be a village there to catch you when you fall. Catch yourself doing things right. Catch yourself doing things well. Catch yourself being full of love. Catch yourself doing your very best. Appreciate yourself and all that you offer to the world. Show yourself the love that you’ve been longing to receive. Immerse yourself in the joy of living as a precious gift to yourself. Wear the crown of Mother proudly. Let it shine upon your kind soul and light up the world as much as you light up your children. And at the end of the day, you will be there. Even when they are gone. Even when you are apart. Even when times are hard. You will always be their mother. And everyone is just fine. They are doing great. They are wonderful. Amazing. Oh yes … because of you. 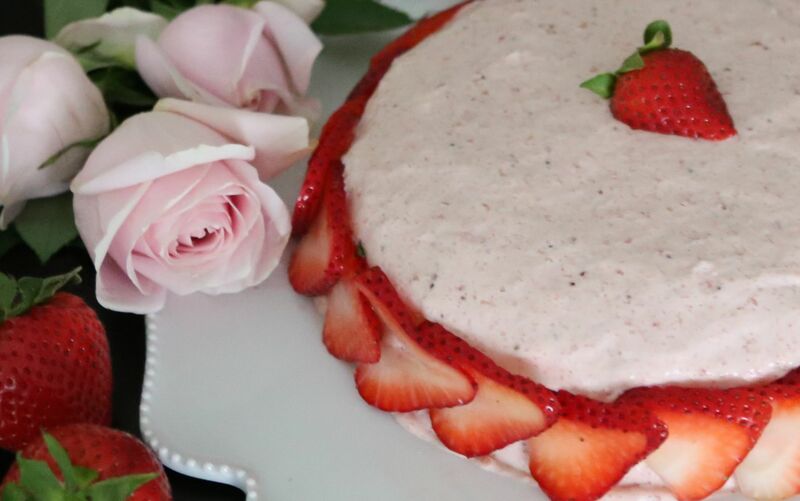 This strawberry chocolate charlotte is a variation of the lovely French cake known as Charlotte Russe. 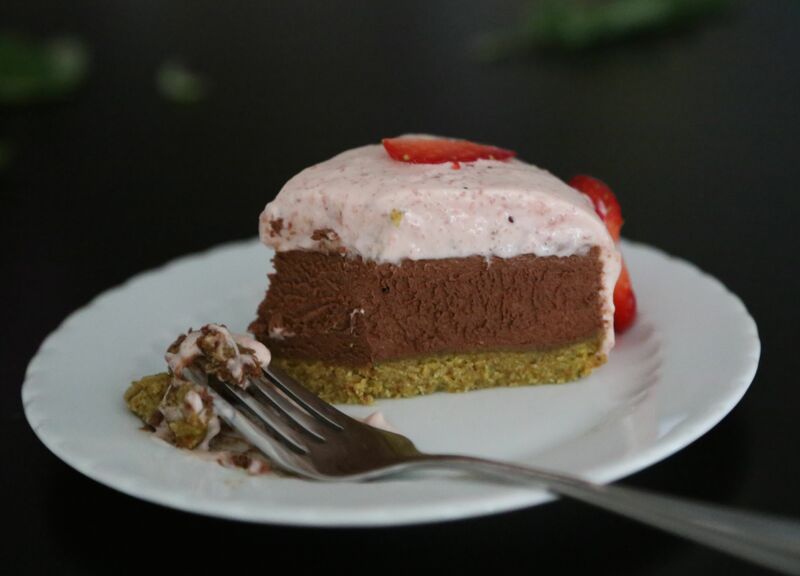 It features a pistachio and almond crust, a decadently smooth chocolate mousse filling, and is topped with strawberry Bavarian cream. In a food processor, blend almonds and pistachios into a semi-smooth meal. Add dates, coconut oil and vanilla. Press mixture on the bottom of an 8″ springform pan. Refrigerate until chocolate mousse is ready to be added to pan. Combine hot water and cocoa in small bowl; set aside. Melt chocolate in large heatproof bowl set over saucepan filled with 1 inch barely simmering water, stirring occasionally, until smooth. Remove from heat and let cool slightly, 2 to 5 minutes. Using stand mixer fitted with whisk, whip cream on medium-low speed until foamy, about 1 minute. Increase speed to high and whip until soft peaks form, 1 to 3 minutes. Whisk cocoa mixture into melted chocolate until smooth. Using hand whisk, fold one-third of whipped cream into chocolate mixture to lighten. Using rubber spatula, fold in remaining whipped cream until no white streaks remain. Spoon mousse into pan over nut crust, smooth top with offset spatula, and gently tap pan on counter to release air bubbles. Wipe inside edge of pan with damp cloth to remove any drips. Refrigerate cake for at least 15 minutes. Place a large mixing bowl in the freezer to chill. Wash strawberries, drain and hull. Put the gelatin sheets in a small bowl of very cold water. Allow to soften about 10 minutes. In a large bowl whisk egg yolks and sugar until slightly pale. Drain the gelatin sheets, squeezing out excess liquid, and set aside. In a saucepan, bring the milk to a simmer. Pour a third of the hot milk over the egg yolks and sugar mixture (to temper the yolks). Whisk together and pour the whole mixture back in the saucepan. Cook over low heat stirring constantly with a wooden spoon until the custard thickens. It should coat the spoon when ready; if you run your finger down the back of the spoon, the custard should not run back into the line. Please note, the custard should never come to a boil. As soon as the custard has this consistency, remove from heat and add the drained gelatin to stop the cooking. Pour into a large bowl. Continue to stir for 5 minutes so that the Bavarian cream stays smooth. Allow to cool completely. Add the hulled strawberries. Using an immersion hand blender or electric mixer, blend together. Keep in refrigerator just long enough for the Bavarian cream to begin to set. Remove the chilled bowl from the freezer. Pour in the very cold heavy cream and whisk until it thickens and becomes firm. Mix the strawberry Bavarian cream, barely set, until smooth. Using a rubber spatula, gently fold in the whipped cream. Pour on top of chocolate mousse and refrigerate. Run thin knife between cake and sides of pan; remove sides of pan. If your Bavarian cream is very soft, you can gently smooth some of the cream from the top along the side of the cake, as I did. Otherwise, you can leave it as is. Decorate with strawberries as you wish. For clean slices, dip your knife into hot water before cutting each slice. This recipe was inspired and adapted from several sources. The nut crust is an adaptation from The Green Kitchen, the chocolate mousse is adapted from the second layer of the Triple Chocolate Mousse Cake I previously posted, and the Bavarian cream from Ladurée’s Strawberry Charlotte. Loving thoughts to all mothers of the world who are doing their best, in whatever their circumstances, to hold everything together. Happy Mother’s Day. Thank you Martine for sharing the heartfelt poem and for your beautiful choice of photos. I feel as if the FTD winged messenger quietly delivered a dozen bouquets on my doorstep. What is your thought if the whole milk and cream are substituted for almond milk? I’m guessing the thickness and creaminess will not be the same and the presentation will not be as pretty but if the taste is not lost? Happy Mother’s Day dear, dear Friend!! Hi Josephine, Happy Mother’s Day. Thank you so much for taking the time to comment. I know you’re quite busy so I really appreciate the time and effort you make to regularly visit, read my posts, and comment. I do! So glad you’re enjoying the flowers. I try to have fresh flowers at home to brighten up our space so I thought I should start sharing them with others, even if only virtually. As for the substitutions on Bavarian cream ingredients, you could possibly substitute the whole milk with something thick like hemp milk or cashew milk/cream, but for the whipping cream…that’s more tricky. I’ve heard you can make a type of whipped cream with very cold coconut milk. I wanted to try it for this recipe, but I heard whipped coconut milk doesn’t remain stiff too long, especially if put in the refrigerator after whipping. so I suppose it might work, in a way, if you plan to eat the dessert immediately. As both the chocolate mousse and the Bavarian cream need to be refrigerated to be set, it might not work. Alternatively, I haven’t tried this but freezing the whipped coconut milk might work. It would then be something like a semifredo. I think. If I experiment, I’ll be sure to let you know! Love to you. Hi Asmae, thanks for your comment. I’m so glad you like the pictures. Thank you. No, I didn’t get a new camera, still using my Canon 6D. I’ve just been playing around with it more, trying to take shots with various settings. I had a few shots of little hands with the strawberries, perhaps I’ll update the post to include one. For Mother’s Day I had a desire to make something pink and very pale green. The Ladurée cake that I was interested in was made of a pale green sponge-like cake. Very pretty, but then I wanted to try something not quite like a traditional cake or Charlotte. I wanted something different. 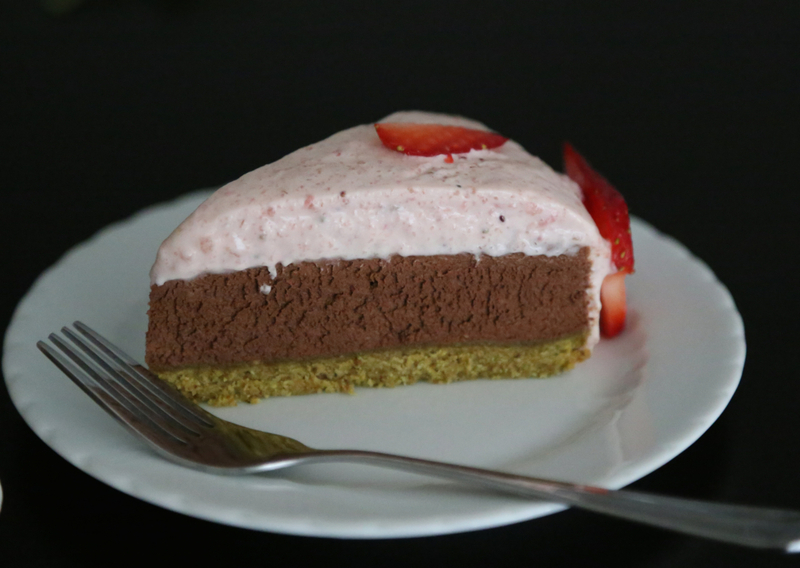 I was afraid the mix of the pistachio crust, chocolate mousse and strawberry Bavarian cream might be too eclectic. Perhaps it was, but I’m glad I tried it. I also considered making a strawberry cheesecake with a pistachio nut crust, but just wanted something a little lighter/creamier on top. Nut crusts are so easy! I can’t wait to try other variations–macadamia nut, almonds, hazelnuts…so many possibilities!